Are there cowboys in India? Huge container ships use huge amounts of fuel. The largest use 1000 or more gallons every hour, 24 hours a day as they travel across the world at little more than 20 miles per hour. Who would buy a car with 50 gallons per mile fuel economy? - at £5 a gallon that’s £250 per mile for every mile covered across the thousands of miles from far eastern ports to good old blighty! 25 tonnes at about 6 miles to the gallon, that’s 150 miles to the gallon for each tonne of freight delivered. The familiar family estate can carry, perhaps, half a tonne at, hopefully, 35 miles to the gallon, so that’s a paltry 17.5 miles per tonne per gallon per mile. Simply put, trucks are about 7 times better than cars, and ship are around 7 times better than trucks and 50 times better than cars at carrying freight. Another way of looking at it is this. If your environmental choice is between driving 150 miles to collect a car load of stone or having a ship deliver it from a third of the way across the planet then go for the ship, it makes environmental sense. Whilst I know that details mean that such a simple analysis can never be exactly correct it is however an important observation. Huge 100,000 horsepower ships engines are twice as thermally efficient as the best car engine, it is therefore a much more environmentally kinder use of a scarce resource to move heavy goods by ship than by road. The environmental distance trucking vs shipping places India to London as if it was in northern Scotland; by car India is a suburb of Bristol by ship. Just because ships consume huge amounts of fossil fuels does not mean that they are the ‘bad guys’. They are the most efficient mass transport vehicles on the planet in a highly competitive industry continually exploiting the most fuel efficient technologies that they can develop. The environment is already an important part of their bottom line and vital for their viability and long term profitability. We were picked up at 9:00 am from our hotel by Sushil, my Granite supplier, and made our way out of Bangalore. On the way we drove through the ‘Silicon Plateau’ and saw huge office buildings with the names of huge multi-nationals on them (Intel, Hewlett Packard, etc.). Sushil told me that Bangalore was the educational capital of India with many students coming from other Indian states to attend the universities, institutes, and medical colleges. The energy and rate of growth reminded me of Singapore 20 years ago. We soon left the city and drove out into the open countryside. It was greener and more lush than Rajasthan. We drove past vineyards and crops along the old road to Chennai, There wasn’t too much traffic, Sushil preferred this to the new road because the traffic was lighter and there was more to see. On the way Sushil told me how he got his first big break in the Business. 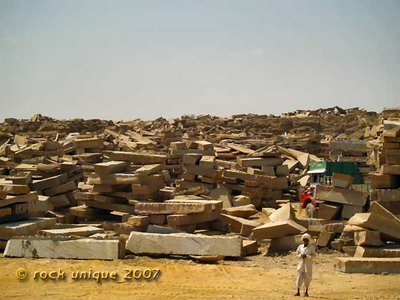 In 1992 the Dutch organisation CBI (Centre for the promotion of imports from developing countries) invited Sushil’s company to present his stone products and fill in a questionnaire about his business. They then reviewed his products along with others from India and also from other countries. Their criteria for selection were that he had product in demand in Europe and that he was following best practice production procedures. He made the shortlist, CBI then visited Sushil’s business and looked at the entire production cycle. His was the only Indian business that won their support. They paid for him to attend the Nuremburg stone show and gave him help to understand how to sell his product at the show. Sushil won his first export contract at the 1993 Nuremburg show and has attended the show every second year since, winning ever more export business. Now 14 years later he runs a substantial international company with exporting throughout Europe and North America. As we drove along I was astounded to see that all the fenceposts in the area were made of granite. Later in the journey we saw some being put in post holes that were easily 2 metres long. It struck me as being a very good permanent solution, it was especially clear that it made sense when I noticed a termite mound next to one of these posts. A wooden fence post would soon be eaten! We soon knew that we were in granite country when we drove past a hill of huge granite boulders, near the foot of which was the local Volvo dealership for heavy earth moving equipment. We were told that outcrops like this are protected and mining is not permitted although sometimes old traditional strip mines that produce stone use for the local market are allowed to continue operating. The granite area is vast, extending from 200km south of Bangalore to 800km north. We could see that the infrastructure in the area was much more developed than in Rajasthan, the road we were travelling on was altogether better and electricity lines paralleled the road and lead to all the villages that we passed. Before we left the main road we stopped at a roadside cafeteria for tea and bottled water. About 90 km out of Bangalore we turned down a secondary road toward our first Quarry. We passed a village and asked if the people living in the local villages worked in the Quarries and were told that the often did but most were farmers. Along the side of the road were enormous hedges of Aloe Vera that both separate the fields and form a crop in it’s own right producing both jelly and a strong fibre. We soon arrived at the first quarry. The license for this quarry had only recently been granted and it was in the very early stages of development. The area being worked was relatively small, perhaps 100 metres by 30 metres and no more than 5 metres deep at it deepest point. The first few metres are a mixture of soil and larger and larger boulders below which in bedrock. 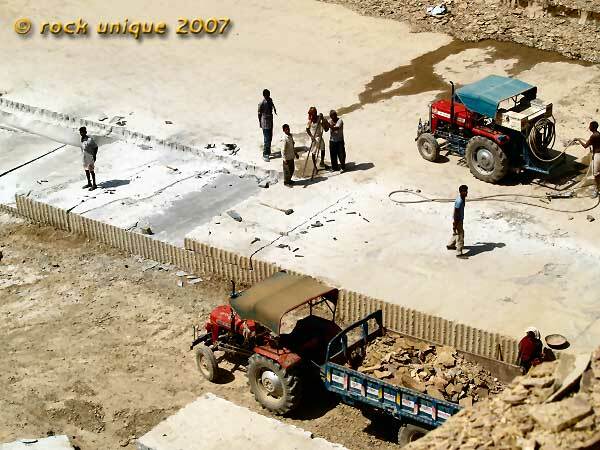 It takes a year or more of development before the block coming out of the quarry is large enough for slab production. The material that is recovered in the earlier stages is used to produce landscaping products, aggregates, and other products for the domestic market. The larger boulders are drilled and broken using explosives. At the time of our visit there were only 5 people working at this quarry. Many of the workers in this area were Roman Catholics and some had already left to prepare for up coming Easter celebrations. 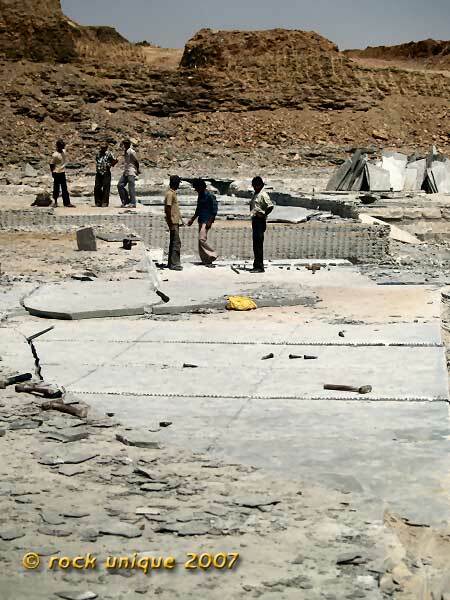 From this quarry we made our way to Sushil’s Factory. Along the way we saw examples of traditional quarrying. This is not for the export market but to produce fence posts and stone for local building work. 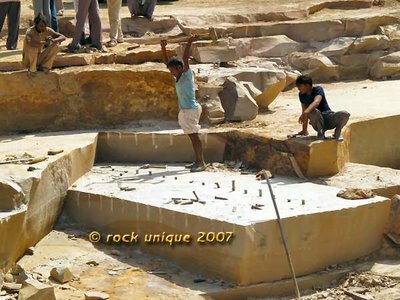 The technique used is step mining, a very different technique from the deep quarries and modern mining techniques used to produce block for cutting into slabs. We asked if there was illegal mining in the area. Sushil said that quarrying without a license is not allowed. He said that some people do it illegally. If they are caught they are arrested. Perhaps it might be the stone on a trailer behind a tractor, these people are like guerrillas. The might spend a few days somewhere quiet off the side of the road and then they are gone. Asked if any of this illegal stone goes to export, he said that no, it was very small scale, for the local market and was used as a free source of stone for building. We asked about migrant workers. 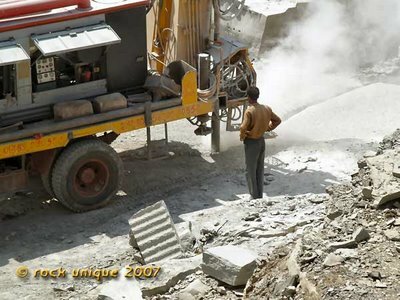 Sushil said that quarries are restricted areas because of the blasting. Unless they know someone they will not take them on, it’s the same for all the quarry owners. He cannot take the risk with the blasting materials, because they might get stolen and used for illegal work –and ‘…that would make us look bad’. As we talked we passed a government tree plantation, the trees were being grown for use in restoring areas where quarrying operations were finished. Soon afterward we passed a wooded area that had once been a quarry. The only real hint of it’s past was that the largest trees were not that old and were all roughly the same size and also that although the terrain was rolling with small hillocks there were none of the granite outcrops and boulders that I would have expected to see. Before long we arrived at Sushil’s factory. It was very impressive, at least on a par with any factory of its type I’d seen in Europe. Everybody was wearing hard hats and boots. There were two of the biggest modern gang saws that I have ever seen and state of the art automatic slab polishing equipment. 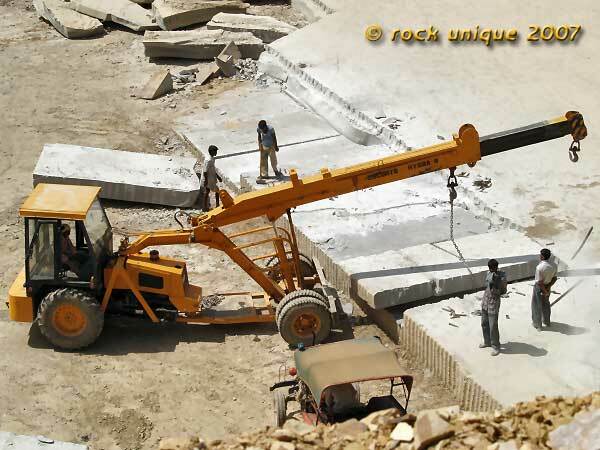 The factory had cranes for moving the slabs around. Slab that was being feed into the slab polishing machine using a tilting hydraulic tilting table which takes it from vertical to horizontal so that it can be fed into the machine. Granite is very hard and so it takes 4 to 7 days of continuous cutting for the gang saw to cut through a block. The gang saw was simply too big to get into a single photograph, regrettably it wasn’t running at the time having just finished a cutting job it was being maintained for the next job. The photo shows the business end of one of the Italian gang saws. The 100 or more blades were being maintained at the time. The block is taken off the delivery truck outside with a gantry crane (Photo 426) which then moves it to the single saw. The single saw is like a giant cheese wire except that the wire is a 8mm thick wire rope with lumps of diamond abrasive, like elongated beads along, fixed around it every few centimetres. This wire is pulled through the stone in a continuous loop to cut the sides of the block square ready for the big gang saws (photo 428). After this the block is concreted in place on a small flat deck truck with steel railway wheels and it makes its final journey into the gang saw on a rail tracks. When the gangsaw is finished cutting the block into slabs each slab is marked to marked to show its provenance. The information captured is detailed, it shows which slab it is, how many were recovered from that block, which quarry it came from and where in the quarry the block came from. There was some accommodation for unmarried workers on site as well as a small temple. Married workers live in nearby towns and villages. This factory also produces tiles, which are cut from slab using smaller saws. In a while we arrived at the second quarry of the day. This quarry was also in the early stages of development being less than a year into its lease. Again there were only a few people working, perhaps 5 or 6 on the site. They were in the later stages of removing the commercially less valuable material to get to the bedrock. Larger boulders were being drilled so that they could be reduced to sizes that heavy machinery could move and trucks can transport. The drilling was noisy work. 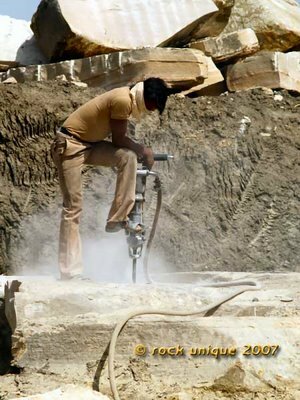 In contrast with the sandstone drilling in Rajasthan the holes being drilled in the granite quarries were deeper, up to a metre, and the stone was much harder. Again we were told that the workers refused to use safety equipment. One of the workers walked with a bad limp. I asked if it was a result of an injury at work and was told that no, he’s been like that since birth. We could see another quarry in the distance and went to visit. The third quarry of the day was about 4 years old and was well into the bedrock. When we arrived could see a large backhoe, as we had in each of the other quarries, and asked how they used such a large machine. We were told that the machine was leased compete with an experienced operator. This made economic sense to the quarry owner, particularly during the first few years when the costs of development exceed income. 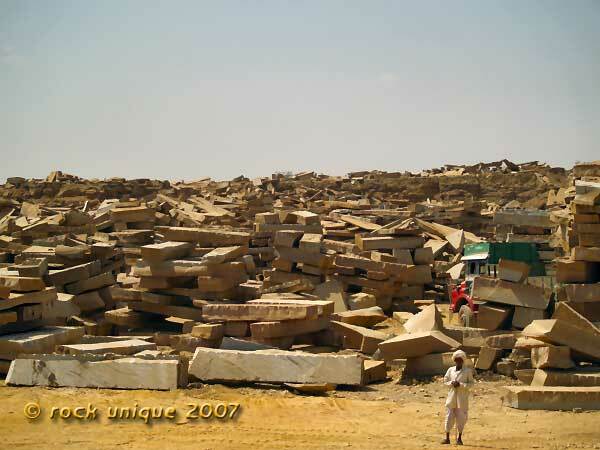 In this quarry granite block was being recovered from the bedrock. The distinctive shear smooth faces left by a wiresaw were 8 to 10 metres high. The technique is to bore holes from the top and in from the side so that they meet deep inside the stone. The wire is threaded through the hole, made into a loop, and attached to the drive unit for the wire saw. In the photo above the wire can just be made out running from the top of the block to the drive unit. From the drive unit the wire runs back into the hole at the bottom . When the block is cut free of the bedrock the backhoe is used to pull the block over onto spoil to soften the landing. 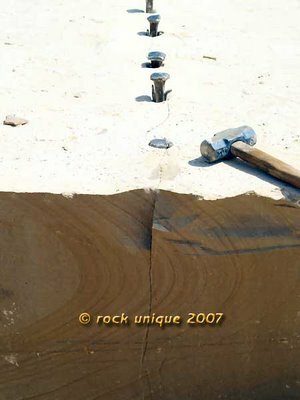 The block is then diced up for transportation by first drilling a row of holes in a line and then filling the holes with a compound that expands when it sets. By the next morning the block will be neatly broken into manageable pieces. Explosives are not normally used for this, as the shock wave from an explosion can cause damage throughout the bulk of the stone. Another technique is to cut the block free and then, instead of toppling it, use the wiresaw to cut the block horizontally partway through at several levels. The backhoe then presses down on the top to snap it into a stack of manageably sized blocks. A bit like a loaf of sliced bread standing on end with 2 metre thick, 20 tonne slices! Block was being recovered on 4 levels. It was getting toward the end of the day. We could see the compound being mixed to pour into holes to split blocks overnight. We left and made our way back to Bangalore. We had a last visit to make to where Sushil produced his landscaping products. He processes granite into cobbles and other hard landscaping on a site of a few acres in Bangalore itself. It was quite dark at the yard, and work had finished for the day. we could see the piles of raw material, finished cobbles, and waste. The manager was there to meet us and we saw what we could in the headlights of the car. I was struck by the fact that we were in the city less than a mile from a busy highway and in a commercial area with huge factories and corporate headquarters. I could not for one moment believe that there would be child labour or worker exploitation in such a visible location in a major city. Up early and on the road at 6am! 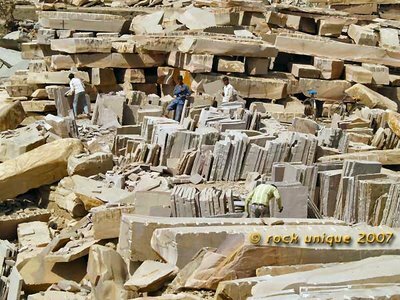 Kailash (our supplier in Rangisthan) took us from Jaipur to view sandstone quarries in the Kotah district some 250km from Jaipur. We passed through Bundi on the way. Traffic in India is very interesting indeed! The road was a single lane in each direction and heavily used by lorries. We were continuously overtaking slow traffic, but even so it was difficult to average 50 kmph and so the 250km journey took a full 5 hours, and 5 hours back as well. It was obvious when we arrived in a stone area: the road wound up a bare stony slope to an arid plateau some 50 metres higher than the greener countryside that we had been travelling through. It was clearly drier and the nature of the agriculture changed. 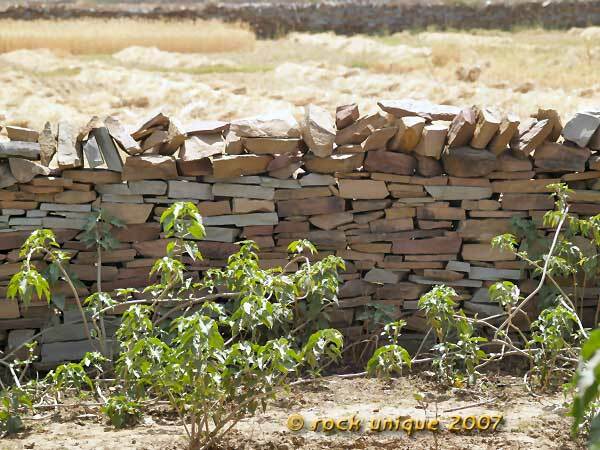 We began to see the first of the dry stone walls that we would see throughout the entire area, dividing up fields. We also started to see more and more stone buildings. Some of the stone walls and buildings were beautifully and precisely built and we could see that some of the stone buildings were rendered and painted. We arrived in a village and picked up the second of the two buyers that work for Kailash in the area (we had picked up the first on the way nearer Jaipur). 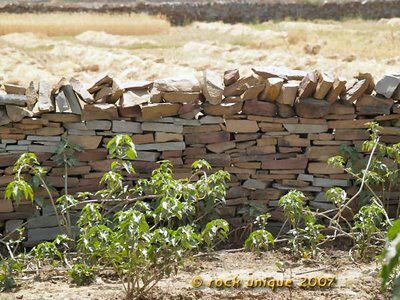 We were now at the fringe of an area covering approximately 40 square kilometres and home to 1,000 sandstone quarries. On either side of the road we could see various businesses that split quarried block and cut paving. These businesses varied in size from small operations occupying a fraction of an acre to a few quite large operations with several acres of open space. We saw empty wooden boxes stacked up ready for packing as well as full boxes. From our car it was difficult to clearly see all of the people working in these areas but I did not see a single woman or child working in these businesses. 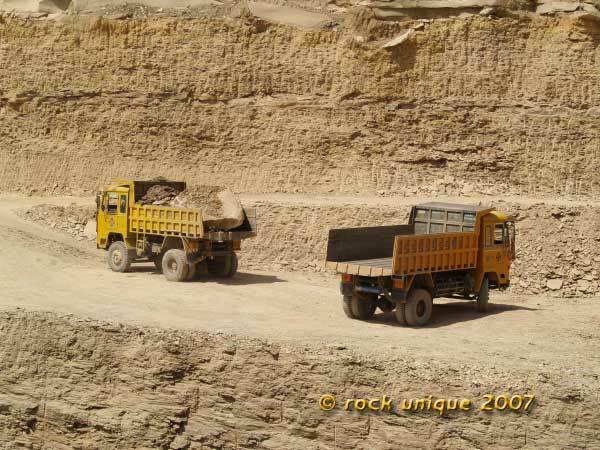 We turned off the main road and, following the directions of Kailash’s buyer, drove toward a cluster of quarries. At first the only evidence of quarrying we could see was a small hill of overburden perhaps 30 metres high. As we approached the quarries, we drove past a primary school with children in school uniform playing outside. We asked our driver if it would be possible to stop at the school on the way back from seeing the first quarries. A kilometre or so further on, just past the hill of overburden, we suddenly arrived at our first quarry. We drove down and parked on a flat area about 3 metres below the level of the surrounding ground. Looking at the sides of the quarry we could see that the uppermost 2 metres was soil and then a metre or so of stone that was made up of boulders of various sizes and quite fractured bedrock. From this level down the bedrock was more continuous down to the level of the quarry floor about 3 metres lower than where we were standing, some 5 metres below ground level. Stone was being recovered from the lower 2 metres of the quarry, working back toward us. There was a small mobile crane used for lifting the blocks as they were recovered and for stacking them ready for transport. There was also a tractor driving an air compressor with hoses snaking across to the rock drills. The stone is recovered layer by layer from the floor of the quarry. Firstly, rows of holes are drilled to outline the next block to be recovered from the face. These holes are drilled about 20cm deep into the stone and are spaced about 20cm apart. I watched for a few minutes as three workers drove wedges into the holes and hammered them home. 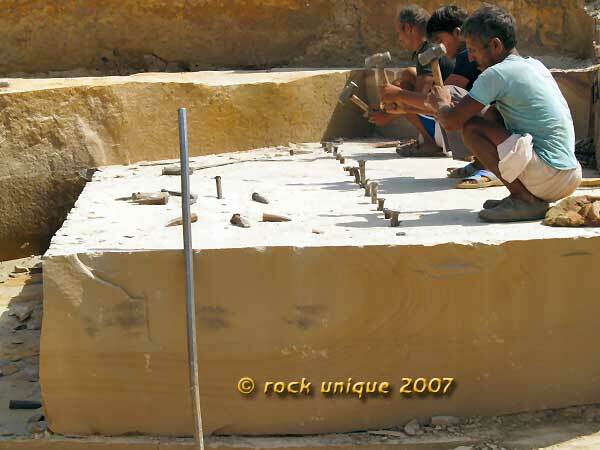 When this was done they used an 18 pound (8kg) sledge hammer to finish setting the wedges and separating the block. Each of the three workers took a turn with the sledge hammer hitting each wedge along the row before passing the hammer on to the next worker. When the third worker was about halfway along the row there was a sound like a single short note on a bass drum and a crack appeared along the line of the wedges. This whole process from putting in the wedges to separating the block weighing 6-8 tonnes took only 5 minutes. While I was taking photos Dave asked the quarry owner about the ages of the workers and was told that the youngest was 25 years old. We asked how many of the 1,000 plus local quarries were illegal and were told none. We asked about child labour and were told that there is no child labour, the work is simply too hard or too skilled. At this quarry only block was being recovered. The blocks were being picked up by a crane and stacked ready for loading onto trucks. This quarry was a source of the block that was being trucked back to Jaipur for processing into the paving, cobbles, sawn elements, and other value added products sold by Rock Unique. We spent a while longer at the quarry watching the floor of the quarry being drilled. The compressor for the pneumatic drill was powered by a tractor on one side of the quarry with air lines running to the drill on the other side. The worker operating the drill was wearing sandals and had a cloth across his face. The drill was relatively noisy but very effective; it was sinking into the stone quite rapidly, taking about a minute to drill each of the holes. We asked about steel capped boots, ear protection, face masks, safety glasses, and health and safety in general. We received the same answer every time we asked this question throughout the day, that safety equipment is readily available for the workers but is simply not used. At the edge of the quarry some blocks had been erected vertically to create walls and large flat slabs placed on top to make a shelter. There is very little shade in a quarry and these shelters are built to provide a place in which to take a break out of the sun. We were told that this quarry was still relatively new, so we asked if we could see a quarry that was more developed. We were driven a very short distance to the quarry next to the big waste pile that we noticed earlier. On the way we had more of a chance to view the site where stone was being split into paving. The second quarry was immediately next to the hill of spoil that we could see as we approached the area. It was only when we turned onto the road leading into the quarry that we began to see how deep down this quarry had gone. This was where the hill of spoil had come from. We parked near the top; there was work being done next to the road and it wasn’t possible to drive down to the floor of the quarry. This quarry was much more mature, having penetrated deep into the bedrock and blocks of grey sandstone was being recovered from a level about 20 metres below the surface. There were about 40 people working on site. In a period of fifteen minutes we saw three blocks separated and removed from two areas along the working face of the quarry. The working area was very clean and clear of debris. There was a tractor driving the compressor for the pneumatic hammer drills and another with a trailer for carting away the debris. Each block was first separated with wedges as we saw in the previous quarry and then manoeuvred using crowbars so that a chain slung from a crane could be used to lift the edge of the block. A lump of debris rock was placed under the block for support to enable the chain to be manually slid up to the mid point and then the block was lifted out. The crane operator was very skilled; he stacked the block to one side, the chain was unhitched as soon as it became slack and he went back to collect the next block. The quarry manager came to talk to us and we were told that the average pay had risen steeply over the last few years to INR10,000 per month (about USD250) from INR6,000 per month 3 years ago. When asked how many people were injured or killed in the quarries each year, he said only 3 or 4. I think that he meant injuries only as we later discovered that there had been zero fatalities in this area over the last few years. This quarry was a much larger operation and there was more heavy equipment in use. We saw a truck-mounted drill being used to drill long lines of holes deep into the bedrock. This method of working was described as being much more cost effective than using hammer drills. Dump trucks were being used to carry the spoil to the hill at the far end of the quarry. I saw two women in the quarry; their job was to take water and tea to the workers throughout the day. The overall impression was of a well-run business using skilled labour and the best available techniques and equipment. We then drove back to the school that we had spotted earlier, a two room government primary school, painted pink on the outside and blue on the inside. We went in and spoke with the head teacher who gave us permission to take photographs. 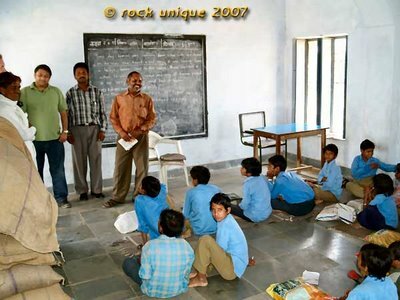 The teacher said that the parents of many of the children worked in the stone business. There were two teachers and I counted forty children. Leaving the school, we drove on to look at more quarries. As we travelled, we saw fields that had loads of soil dumped on them. I was later told that this fertile topsoil had come from quarry overburden and was being spread over fields, especially those that had exposed bedrock or very thin soil with the intention of improving the agricultural potential of the land. We also saw more schools, most of them with just one or two rooms. Eventually, we arrived at a very large quarry where hundreds, if not thousands, of blocks were stacked up by the road that wove between them and we made our way to the part of the quarry being worked. As with the previous quarries, our visit was not expected. 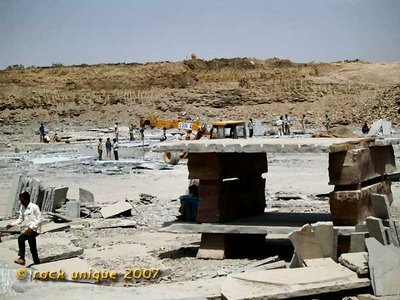 All the staff we saw in this quarry were adult and male, and again we saw sun shelters made of blocks and large slabs. We left this quarry and travelled to yet another very large quarry, passing many more small schools on the way. As we entered this new quarry, we again saw shelters made of block. This quarry differed from the others as stone was being split into paving on site. We could see the long lines of holes drilled by truck-mounted equipment.In this quarry the stone was being recovered not in blocks but in thinner slabs, often less than 10cm thick.This seemed to be because the stone was being split on site and slab was preferable to work with than thicker, heavier block.We could see that this thinner stone was sometimes fracturing as it was being recovered resulting in higher wastage rates. The quarry owner claimed 500 people worked on the site. David asked the owner where the quarry workers children went to school and was told “at the government schools”. David then asked if these were the pink buildings that are painted blue inside to which the quarry owner replied “yes”. As we left, we could see that at least one other area on the far side of the quarry was also being actively worked. After leaving this quarry we saw an area that had formerly been a quarry but had been back-filled and planted with trees, in the midst of which was a lake. Further on we saw two larger schools, which we were told that they were for older children; they looked like the local high schools. As we were leaving the area we saw construction works for a dual lane highway, and told that this road would be running first to Bundi, the city that we passed on the way, and then on to Jaipur. We had averaged 50 km/h getting out to the quarries, it was very clear that a new road would make an enormous difference. The first quarry we had visited was probably no more than 10 km from the last, in this area we saw at least 8 schools. 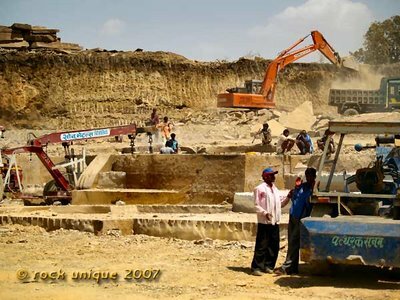 Our visits were unscheduled and unannounced and in this one day we directly observed some 200 adults working in the quarries, including two women, yet we did not see a single child working in any of the quarries. Chris and David flew out of Britain yesterday. The trip is starting with a short visit to Nepal, after which they will travel down to Jaipur which is the main city of Rajasthan and a major centre for flagstone paving. We might get a post and a few piccies over the weekend, but it is more likely to be early next week before the first message from our intrepid explorers finds its way back to Britain. It will be posted here as soon as it is received...keep reading, and feel free to comment on anything posted. Copyright © 2007 - pavingexpert.com - Rock Unique - Outdoor Room Co.